I am a sucker for a good sunset. The pretty purple, pink and orange hues of the sky make me feel calm and peaceful. Looking up at dusk gives me a moment to release all negativity, my body relaxes, and I have my very own moment to just appreciate our Earth. How come the sky can change appearance like that? Any other time of the day, it is one solid color, whether that be bright blue or yucky gray. Then, slowly and magnificently I look up and see a blending of spectacular color prepare for the boring, solid colored nightfall. 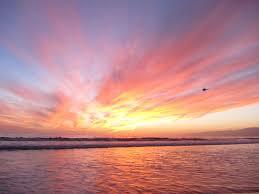 We have done a lot of harm to our planet in a short period of time, which also affects our sunsets. Our own aerosol pollution changes the way the colors appear at sunset according to Coco Ballantyne. Ballantyne says human pollution makes the sunset more red than it would be otherwise. Certain places have more pollution just based off of population, so that can alter what you see where. It does not matter whether you like red skies or not, we need to take notice how we are changing our environment. Even though the color of the sunset does not seem like a big deal, we need to preserve nature in the way it functions without our interference or else much worse effects will continue to occur. Clouds are another feature that comes into play with sunsets. In the same article linked above, Corfidi says that high up clouds, cirrus and altocumulus, get the light that still has all of its color. He says those clouds can make amazing colors. Knowing the science behind sunsets kind of takes the beauty out of it. Sometimes I just like to think beauty is naturally occurring with no explanation. I still will be able to enjoy sunsets, but I think with less fervor because I will just be thinking about the process light takes to make those pretty colors. I hope the awe of the beauty will outweigh the plain guidelines that make the sunsets what they are. This entry was posted in Uncategorized on October 21, 2016 by Erin Nicole Kemp. Some of the best places to watch the sunset around here are the Arboretum and Bald Eagle State Park. The sunset cannot get better than on the edge of the lake. One of the coolest things in my opinion are the layers of color which aparently are caused by the earth’s 180 degree shadow! The color combos are uncountable but here are the most common! !